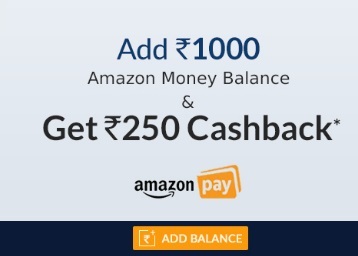 Amazon is one of the best loot offering sites.Now they are back with Cashback offer.They are offering 25% Cashback Upto Rs.250 First Time Adding Money in Amazon Pay Balance Wallet of Rs.300.This offer is valid only on first time add money. NOTE : Offer is valid on First Time Add Money. Maximum cashback amount is Rs.250, Minimum add amount is Rs.300. So you can also add Rs.500 then you will get Rs.125 cashback. If you will add Rs.1000 then you will get Rs.1250 in wallet. Enter Amount Rs.12000 (Minimum Rs.300). Finally extra 25% cahsback (Rs.250) will be added to your amazon account by 9th September 2017. Offer period: August 17th to August 27th 2017. The customer will receive the cashback amount by 9th September, 2017.